Do you want to know where you can get the fastest internet speeds? Would it affect your decision about where to live? 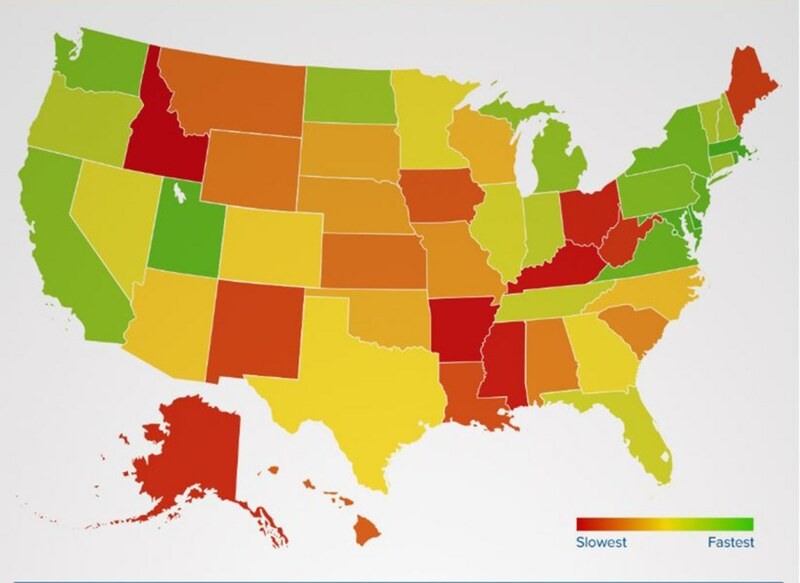 Would it help to know which states get the fastest broadband speeds? Fortunately for you, the information is now available. M-Lab has published state-by-state rankings based on 42 million speed tests compiled over a year. M-Lab’s source was Cable Co UK. Google Open Source Research, Princeton University’s PlanetLab, and New America’s Open Technology Institute also supported the effort. According to the M-Lab report, Rhode Island leads the nation in average broadband speed, with 36.7 megabits per second. Washington and Massachusetts follow, with 34.35 and 34.1 MB/S, respectively. Apart from Washington and Oregon, all of the top 10 states and jurisdictions- including DC- are in the East. Montana ranked dead last among all states, with an average of 10.9 MB/S. The city with the slowest internet service was Alaska’s Southerly North Slope BO, with a glacial average of merely 0.28 MB/S. This is much slower than the average DSL connection. It is not at all comparable to typical cable or fiber-optic internet. Downloading an HD movie in Rhode Island would take an average of 27 minutes and 53 seconds. In Montana it would take more than three times as long: an hour and 33 minutes. M-Lab helps ISPs diagnose the sources of connection problems. PlanetLabs conducts research to encourage development of new network services. Wherever you live, shop with Bundle Deals for the best deals in internet service. Compare all providers and plans. Then order any service with just one phone call.